What we provide our Clients and how you can share in providing our services to your Clients. Most of our clients average between 17% – 35% cost savings. It is from those savings that LIMITLESS is compensated. Bottom line we must PROVE the savings in order to be paid and – our Clients RECEIVE the refund, credit, or go forward savings before we invoice for our services. As an Agent for LIMITLESS when you provide your Client with savings we reward you with a compensation. Therefore, it is a WIN – WIN for Client and Agent. 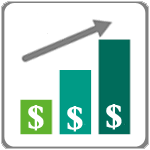 Simply said we help companies increase profits by reducing costs …. So how much do companies save? According to a Aberdeen Group report, 85% of mid-sized companies telecom bills are paid in full without audit, and Fortune 500 companies pay an average of over 3% of total expenses on telecom. 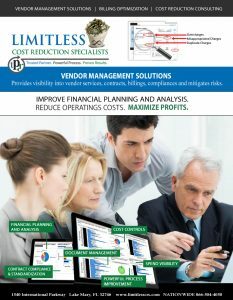 That said LIMITLESS is poised to offer a solution to this large, diverse and lucrative market with its Audit and Telecom Expense Management (TEM) services. 100% of LIMITLESS clients receive refunds, credits or savings that average over 25%, coupled with over 200 hours of employee resource time saved without changing carriers and little to impact on the clients operations…read more. 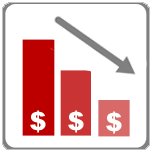 75% of organizations have errors or savings opportunities on their utility bills. It has been said, “You cannot manage risk without managing information.” LIMITLESS manages the information companies need to manage usage, expense, budgets, sustainability, and all the other risks posed by a complicated utility environment. Most in-house auditors do not have the time or expertise to carefully review invoices for complex billing issues. We can review your electric, gas, fuel, water, sewer, and cable/internet bills… read more or if you are ready to choose what program is best for you click below. Ready to Join the LIMITLESS AGENT TEAM? 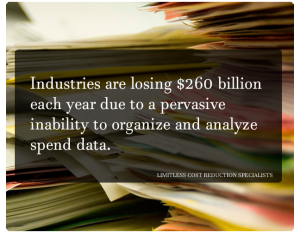 LIMITLESS brings a strong staffing bench and advanced technologies, enabling us to successfully recover hundreds of millions of dollars on our clients’ behalf. Our expert staff conducts thorough & effective utility audits which, in addition to the cost reductions on clients’ bills, also results in pinpointing operational waste and physical efficiency improvements. A few steps and you’ll be on your way to increasing profits. LIMITLESS focuses on those with telecom spends of $10k or more per month as a way of maximizing the savings which leads to larger commission pools for agents. Most mid to large companies have significant telecom and utility spend. These Companies personnel may be able to conduct internal audits on these services and find some savings, although most Companies personnel do not have the experience and expertise LIMITLESS brings to the table. Using Company’s staff talents in this way is a “big miss” if a no cost service of expert auditors can provided deeper and more significant return on a shared savings basis. The LIMITLESS model is set up to allow you to maximize your efforts by allowing you to do what you do best, foster relationships that lead to win-win situations for the client, you and LIMITLESS. LIMITLESS provides 24 hour training portals auditing processes, staff, sales training, product knowledge, industry knowledge and marketing materials to support your introduction of services. You provide the drive and innovation that only great leaders and solution based business development professionals can deliver. Years of experience have produced multiple Raving Fans who save money every month. Using your past C-suite level contacts will easily produce signed contracts every month as there is nothing to sell but the savings! How do we do it? It is simple really. We have a formula and a philosophy to MAKE IT EASY! Are you ready for more information or to enroll. Click Below. When joining the Agent Program with LIMITLESS, our promise is to help you SUCCEED and your Clients SAVE!